It’s Friday – you could use a distraction. So how about a nice long list of awesomely customized speakers done by sound freaks across the interwebz? Yeah, I thought that’d get your attention. While we could easily fit our entire collection of Bluetooth speakers on to the list, we thought it’d be a bit more fun to scour the deepest nooks and furthest crannies of the internet to see what other audiophiles are doing with their speakers. To say the least, we weren’t disappointed. Here’s 17 more, in no particular order, that took our breath away. While tech geek Kenneth Guglielmino doesn’t necessarily have the support staff nor technical know-how to create top-notch wearable portable speakers like ours, we have to give the guy a tip of the hat for his effort here. 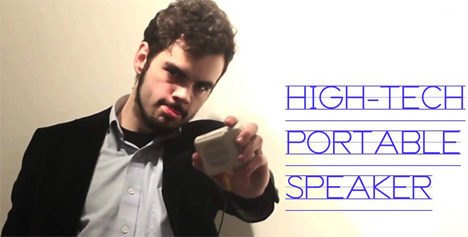 He took an Arduino, Adafruit Wave Shield, and a mini speaker, and put the components in a suit jacket to give him a wearable sound effects machines that he can take everywhere. Sound effects include a laugh track, boos, an air horn, and more. They’re all controlled via a small control panel that allows him to activate sounds and switch between options. Nothing is seen as all components are kept in the jacket’s inner pockets. Forget Beats by Dre – here’s a gnarly new set of headphones that’ll definitely get you noticed. Constructed by YouTube user lyberty5, these headphones actually come from an old SNES controller. He or she posted a pretty cool video on YouTube of the whole modification—check it out after the jump.